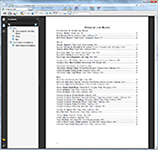 Wine Menu Manager 5.0 (WMM) is an online wine list management tool used to easily create, price, and print accurate wine, beer, and spirits lists for restaurants, hotels, and retailers. Beverage lists in WMM can be organized into custom regional or varietal categories, or progressively-by flavor. Progressive lists will typically lead to an increase in wine sales as they make it easier for guests to find wines they like. Wines are listed from mildest to most intense within each flavor category. By asking a few questions about a guest's flavor preferences, a server can make a confident wine recommendation from a well organized progressive list. Additionally, guests feel comfortable participating in the experience and are able to make educated choices. Progressive wine lists significantly reduce the intimidation factor wine has on both servers and guests, resulting in higher wine sales and more satisfied customers. This module adds a layer to WMM enabling an organization to build their company’s core wines/spirits/beers and any pricing guidelines into WineQuest for addition to their locations beverage menus. There is also a reporting system that provides corporate access to compliance reporting across their enterprise. These reports allow headquarters/regional/divisional managers to quickly verify which outlets have added the core products to their beverage menus. This tool also provides each restaurant/outlet a compliance snapshot to see missing and/or mispriced core products. 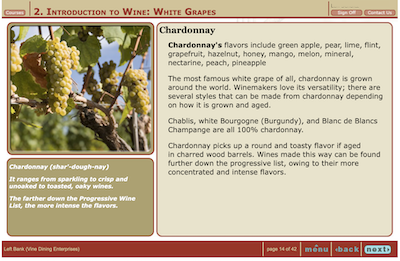 Each core wine contains a PDF information sheet along with web links to producer's websites to help servers and bartenders learn about individual wines. The Core Product Manager is a great time saver and an excellent tool to drive core wine sales at all of your locations. Add Wines, Beers, and Spirits, to your lists from the WineQuest database of 372,235 products. Every beverage in the database has been verified and checked for correctness by our team of wine & spirits professionals. Each wine is assigned a unique flavor profile by our team that determines its ranking and presentation on any progressive list. Get information about each product: producer, appellation, story, tasting notes, sell sheets, ratings etc. to enhance your menus and educate your staff. Developed by our team of wine/spirits professionals, these in-depth training modules will teach your staff about grape varieties, beer styles, spirits, and how to sell wine using the progressive wine list. There is also a course dedicated to improving Banquet & Catering sales. Track your associates' progress with our Learner Reports. 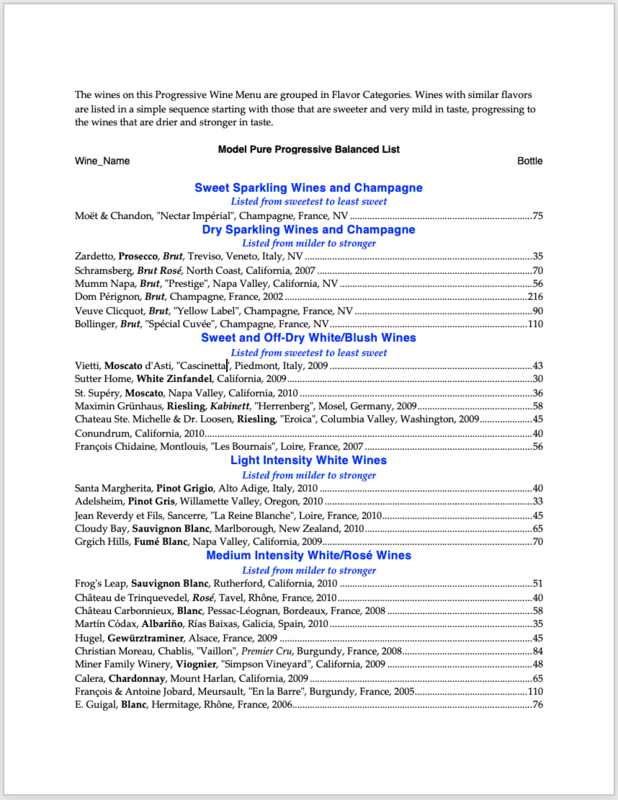 WineQuest can take a copy of your current wine menu and create an identical custom template in .PDF format for use in WMM. The templates save hours previously spent adjusting and formatting page breaks, spelling issues, page numbering, etc. WineQuest automates the entire process and brand guidelines are maintained. Updating your menus now takes seconds: add a wine, change a price, and print - no additional formatting necessary. Post your WineQuest wine menus to your website with just a click of a button. Any changes made to your wine lists can be updated on your e-menus in seconds. It’s that easy. WineQuest can interface your wine lists to digital devices such as iPad menus and digital systems like inventory. This allows you to maintain the product content, currency, integrity, and list accuracy in WineQuest throughout your digital enterprise. WineQuest is the first and the best at 1:1 predictive wine analytics. Our technology generates accurate preferential predictions by matching individual consumer wine flavor preferences and aversions to product-specific flavor attributes. The methodology is sophisticated and detailed so it can identify small nuances in personal preferences, thereby directing consumers to the wines that will "wow" their tastes, resulting in more positive purchase experiences. Our tools can help transform a product category often characterized by confusion and low brand loyalty into one that nurtures consumer trust, increases purchase confidence, and generates repeat business.